Poach walleye in lemon juice and EV olive oil, about 3 tablespoons of each in glass dish (coat both sides of fish with lemon juice and olive oil), sea salt and cayenne pepper on top of fish. 3-4 minutes before it is done, add 3-4 handfuls of fresh spinach. push down to submerge in water. about 2 cups of grape or cherry tomatoes, cut in half. Serve pasta with walleye on plate. 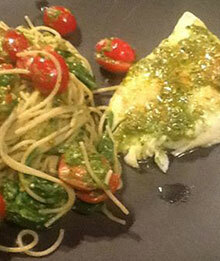 Can add a tablepoon of pesto on top of fish if desired. Store remaining pesto in fridge or freezer.